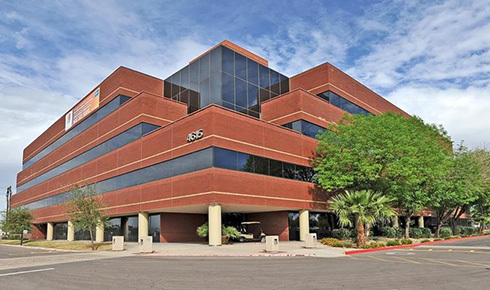 The Muller Co. and Harbert Management Corp. are nearing completion of the first phase of their $20 million redevelopment of Sky Harbor Towers, a 13.6-acre, two-building office campus in the Sky Harbor submarket of Greater Phoenix. The 215,000-square-foot complex at 4605 and 4615 E. Elwood St. will be ready for tenants this spring. The complex, which used to have a third building, is being repositioned as a state-of-the-art, amenity-rich modern office space. A portion of the campus was acquired in 2015 by the Arizona Department of Transportation for a freeway widening project. The Muller Co. decided to demolish the smallest of the three buildings and use the space for more parking in a redeveloped office campus.